Robert Buck While attending Florida A&M University, Robert Buck began to develop his design skills by producing customized gear for artists in the music industry. His enthusiasm for designing mens’ sports and casual wear led to the formation of his notable label known as Habari Clothing Company. “Habari” a Swahili expression translated as “new informative message” is the base for Robert’s label. 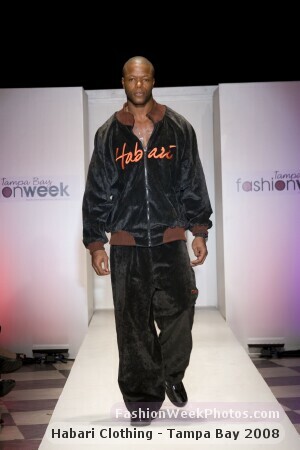 Honorable messages, notable designs and innovative fabrics are the key ingredients of classic Habari clothing. With the goal of inspiring the nation, Habari Clothing Company introduces the fashion world to its message and its movement. If you use the images from this page, you must list comments along with each photo, "Courtesy of Fashion Week Tampa Bay OR include the website: www.fashionweektampabay.com"
The images above were taken during Fashion Week in Tampa September 2008. The event date was Sept. 24 - 27th, 2008. Fashion Week Tampa Bay will epitomize the fashion scene in the Bay area with an annual event that celebrates the style that’s uniquely Tampa Bay’s very own. This event will bring together the Bay area’s most talented fashion and accessories designers and showcase their work for local and national retail buyers, local boutique owners and consumers. In addition, local business partners, aspiring models and community members will have an opportunity to experience quality style and trendsetters in their own city, while providing all lovers of creativity a week of positive, high-fashion and artistic energy. Whether it’s high-fashion, custom-fitted clothing or ready-to-wear, no one does it like Tampa Bay!